Here's something I did for a Social Media course recently, on the Amazon Reviews and Ratings System. Since I sometimes do analysis of publishing phenomena, using this data, I thought it might be worth posting the summary for people who don't know some of the background of how the system works. The "Conversation Prism" is a bit of social media jargon, a way of organizing all the products and tools out there. You can read more about it at the link below. 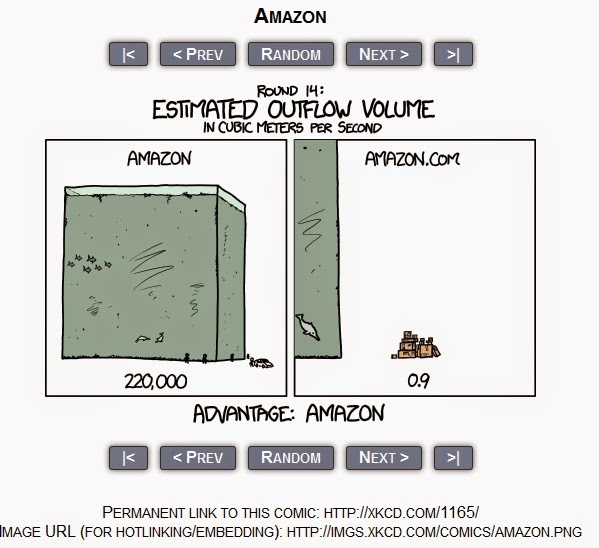 And here's a comic that puts out puny human efforts in perspective, vis "Amazon". Reviews and Ratings are an essential spoke of the Conversation Prism. These allow people to weigh in on their satisfaction with products and services that they have purchased, as well as the overall experience of purchasing and using those products and services. This constitutes one of the most persuasive and trusted forms of "social proof" - the next best thing to word of mouth, by far the most trusted type of customer information. The Amazon.com Reviews and Rating facility is one of the largest and most important sites of its type on the internet, Reviews and ratings can be made about any product or service provided by Amazon or one of its third party distributors. This, of course, includes book reviews. Some details of the Amazon Review and Rating system are given below. Give reasons for liking or disliking a product, as well as stating feelings. Maintain a proper length, not too long or short (i.e. 75 to 500 words). Be sincere and honest with both praise and criticism. Disclose any potential conflicts of interest (e.g. receiving a free copy of the product). The Amazon rating system uses a 5 star scale, with 5 being maximum satisfaction. These ratings are then aggregated and averaged by Amazon, with the result displayed beside the product or service on Amazon’s website. to have objectionable or inappropriate content. to be written by someone promoting the product on behalf of the producer, who has a close business or personal relationship with that producer. to be a paid review, though a review of a free or discounted product is acceptable if that is disclosed in the review. The product is used on a daily basis by tens of millions of Amazon customers worldwide. But the impact goes beyond Amazon's own customer base; for example, a book that has many excellent Amazon reviews will be able to use that social proof in its other promotional efforts. As noted previously, the big strength of on-line review systems is that they emulate word of mouth recommendations, but in an on-line environment. They therefore constitute a form of social proof, a key influencer in human decision making. Perhaps one of the most impressive indications of the strength of Amazon's review system is the amount of attention paid to it by business pundits, academics and statistical analysts. Its reach among consumers, both in terms of depth (numbers of people) and breadth (variety of products) ensures that it is considered one of the major players in this area of social media. The primary weakness of Amazon's review system is thought to be its susceptibility to abuse by "gaming the system". For example, Forbes has written about writers admitting to "sock puppet" reviews (reviews posted by writers using fake names) and writers' using friends and others to "create a buzz" via favourable reviews. The article also notes the possibility of writers undermining competitors via phoney one star reviews. Naturally, these problems can also arise with other categories of product and service reviews. Amazon has attempted to address these concerns on multiple occasions, via cracking down on suspicious reviews and removing them, if it flags them as violating their terms of service, especially as related to reviewers having a conflict of interest. Indeed, it has recently gone as far as bringing suit against persons that it suspects of selling fake 4 and 5 star reviews. The tool costs nothing on the part of the customer, except the time to read and/or write reviews. Of course this can be a considerable investment of time for some products. Some books, for example have tens of thousands of reviews. As for the producer of the product being reviewed, the cost is free, though it may be smart to devote considerable resources to "reviewing the reviews". This may vary from informal case by case scrutiny, to complex statistical analysis.